“I've always enjoyed painting and writing. It started with animals and gradually worked its way to people. It's fascinating to watch a painting come to life from scratch to finish, or a piece of a story develop far beyond the normal complexity of snippets or poetry. Every painting has a story behind it. Every story has a picture to paint. So I'm just an endless beacon of stories for both worlds. The world of Art. The world of Storytelling. There's no living without either. Bonnie was born in Richmond, VA with an interest in art and writing. She graduated in 2005 with a Bachelor's Degree in Fine Arts and went to work as a Graphic Designer. In 2010, she published her first novel, and has been diligently working on the series ever since. 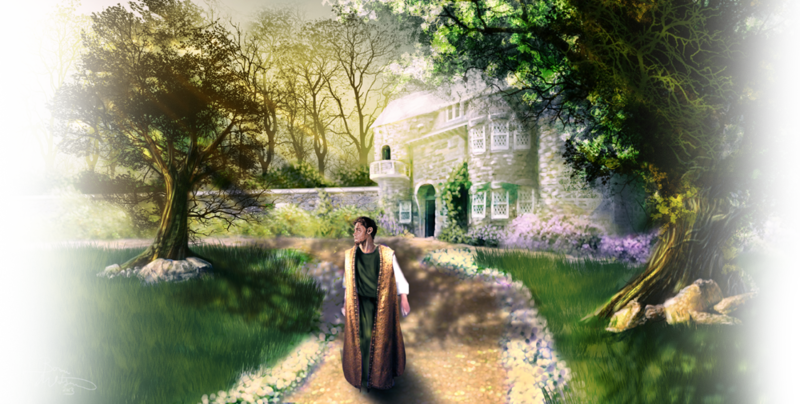 Her love for medieval fantasy is apparent in much of her artwork, and can be viewed, along with various other writing projects, on her blogs and gallery pages. Bonnie has also had several pieces of literature published through the Chesterfield Writer’s Club: short stories The Third Child and The Portrait, and poetry False Security. Through the Anthology of Poetry: Mists of Clouds Hung in the Sky. Her background in illustration has earned a small reputation with several authors. Her works have been published in the form of book covers, such as River Passage, Homemade Sin, and Lives. Developing the initial story didn’t come about easily. My first character attempt was a cat. But as time went on I realized a cat wouldn’t do. Nor was I satisfied drawing cats. As an illustrator, I wanted to advance my art skills. When I went to college, I studied the figure. I would look at book covers and think how much better an actual human would be as the main character. Little did I realize “human” was beyond what I’d end up with. I loved fantasy. My first fantasy novel was The Western Wizard by Mickey Zucker Reichert. That gradually shifted to Dragonlance, written by Tracy Hickman and Margaret Weis. Back then, I didn’t really know how to build a novel, so I used the novels I read to lay the story out. My first book ended in a 200 page series of short stories, with no consistent plot. What it did do was build my first set of characters. I liked what I had; it just needed work. I wrote tons of short stories. Some of which I keep locked away! It wouldn’t be until the year 2000 that I began to write the first book in a trilogy that focused on a young boy striving to understand what he was and where he came from in a land where human settlement was less than a century old. Then I got to thinking, what if? I’m a horse fanatic, used to ride when I was younger. So naturally a unicorn story would fit the picture, but I didn’t want something out of the norm. Plus there are many stories about wizards, magic, and much more. Tolken saw to that in Lord of the Rings. And Narnia took care of many of mythological creatures. But what if there was one out of the ordinary? What if there was a dark unicorn? What if unicorns were supposed to be all white? What if they were all female? How would they reproduce? How do they tie in with Nature or relate to the main character? Copyright © 2013 Wisdom Novels. All Rights Reserved.